Numsa says the steel company should permanently employ all workers presently employed by the contractors. The National Union of Metalworkers of South Africa said on Tuesday it had gone on strike at ArcelorMittal, accusing the steel company of abusing workers through labour brokers. Numsa said the strike would affect all ArcelorMittal operations in Vanderbijlpark. “Large numbers of our members are employed through contractors… but work for ArcelorMittal. We are told that the contractors are service providers and not labour brokers,” it said. The union accused ArcelorMittal of circumventing a Constitutional Court ruling last year stipulating that workers brought in through labour brokers must become permanently employed after three months of working full time for the main employer. 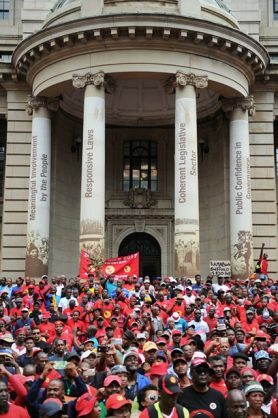 “Our key demand is that Arcelor Mittal must permanently employ all workers presently employed by the contractors who render their services to ArcelorMittal,” Numsa said.